Hi everyone! Thanks for stopping by today. I’m sharing a project with a “warm fuzzies” theme to celebrate EllenHutson.com’s 12th Anniversary. And what says “warm fuzzies” like some adorable wool mittens? This post is actually a part of a fun InstaHop, so if you want to see all of the other “warm fuzzies” inspired posts, be sure to head over to my Instagram. In today’s video tutorial, I’ll show you how I created custom striped felt mittens. Aren’t they just the cutest? And I think you’ll be surprised at how easy they are! You can watch today’s video above, or in HD on my YouTube channel by clicking HERE. 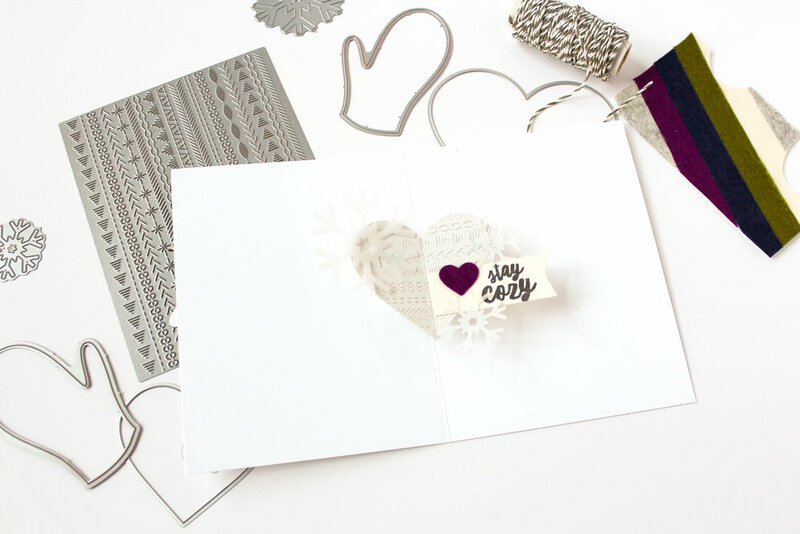 This card also features a fun, surprise pop-up element on the inside of the card. It’s quick and easy to assemble using the Essentials By Ellen Pop-Up Mittens Die Set. I created another card featuring this pop up element a couple weeks ago. If you want to see that video tutorial, click HERE. Thanks for stopping by today. I hope you enjoyed this card…and that it left you with the warm fuzzies and all the cozy feelings associated with that. Until next time, I hope you have a fabulous day!